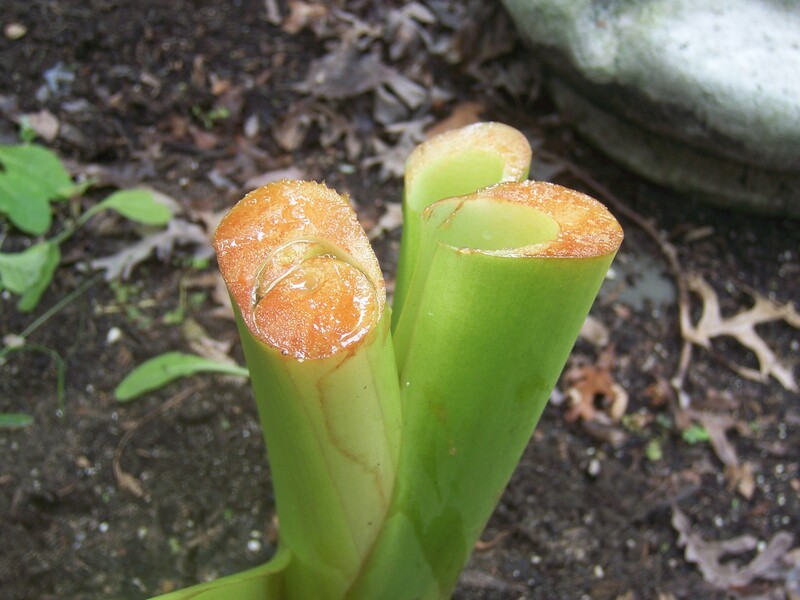 With frost rapidly approaching, it’s time to remove my tender Elephant Ears and prepare them for winter storage. My method is something that I have adapted over the years, and it’s based on what I’ve learned after saving dahlias and caladium. What you will need: garden clippers, a pitchfork or shovel, old clothes, nerves of steel. Step 1: The first thing to do is cut back the stems. I try to leave about 8″ to 10″ of stem. No matter how many times I have done this, I always feel a little guilty because the leaves have reached their fullest. But, alas, all good things must come to an end. Do not be surprised if there is a gush of water that pours from the stalk after you make your cut. Step 2: After the stalks are cut, within minutes they begin to “bleed.” If you decide to try this project, be sure to wear old clothes — the brown/red liquid will stain and it does not come out in the wash. I learned this the hard way, and now I have my Elephant Ear cutting outfit. Step 3: Using the pitchfork, I carefully work in a circle, prying up the bulb. 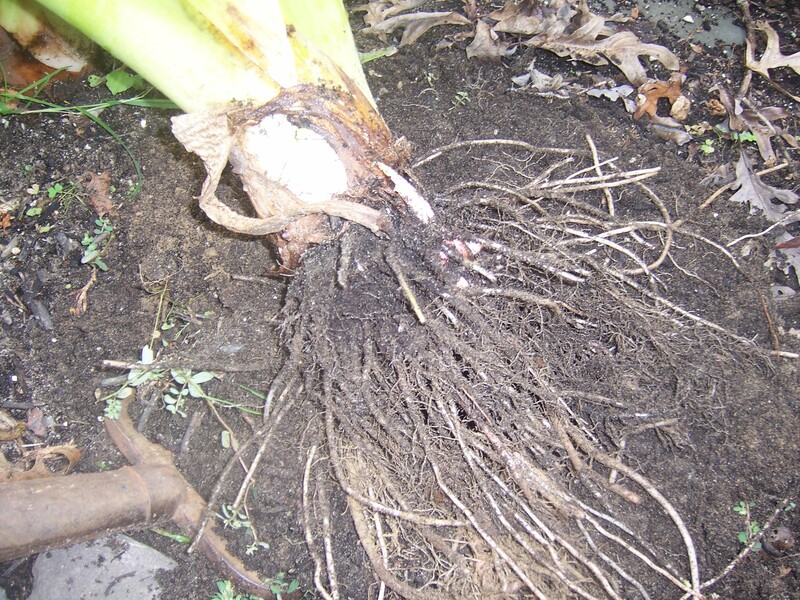 Once it feels loose, I gently pull the base upward, revealing the bulb and the wild mass of roots. At this point, I will shake off the excess dirt. You may notice that your main bulb might have smaller bulbs attached. Do not separate these at this time — that task will be much easier in the spring when you replant your bulb. Step 4: Here we have pretty Elephant Ears all lined up in a row. Once the plants are dug, I store them for a little more than a week in the potting shed. It’s warm enough and dry enough for the bulbs to set before they are packed away. Stay tuned for a future post on the final step. Oh my word…it’s like a full blown autopsy!!! Pass me a bucket…I’m gonna hurl!!!!!!!! Gardening can be an ugly job. . . . Thanks for stopping in. Glad you enjoyed the post. Interesting, though, and compelling reading. Hi Lilith. Like I said, it can be rough out there, but I just keep telling myself it will be worth it next growing season. I am such a lazy gardener. I can not imagine going through this every year! Thanks, though, for the tutorial for gardeners that like to work! My pleasure. I have to admit that since the gardening bug bit me, things gave gotten a little bit extreme — and there are days when I think I have to slow down. But then I wouldn’t have Elephant Ears in my zone. I’ve often looked at Elephant Ears but never bought them because I didn’t know how to keep them overwinter. This is perfect, can’t wait for the next step. I have found that they are indestructible — and really don’t mind the rough handling. I plan to finish this project this weekend. Next up: Canna. Another bleeding plant! I once came across a gruesome sight that looked just like pus and blood. It was coming from a dogwood my husband had cut down. I took a photo, and one really couldn’t tell that it wasn’t human. Yuck! Good info on the elephant ear, by the way. I saw that photo on your blog — very creepy! The blood from the Elephant Ear isn’t creepy — just messy. Thanks for the reminder Kevin. I have got to get mine cut and brought in too. I am just not ready for gardening to end yet. If I planted an Elephant Ear in a pot, how large would the pot need to be? I generally go by the size of the corm. For a large corm, you can use a larger pot. 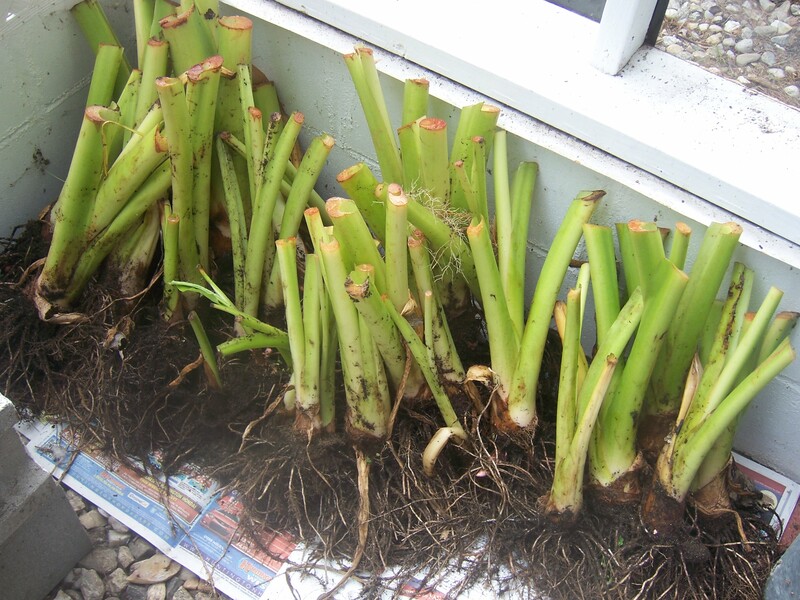 I’ve planted smaller corms in 8″ pots and then just move them around to fill in bare spots. You can then bring the pot (plant and all) inside for the winter. It will die back, but just bring it outside again when the weather warms up. Remember, they’re tropical. Mine have “graduated” to a 24+” pot, I bring the pot and all in for the winter. In early fall, I start using the leaves as molds for concrete bird baths, stepping stones and other fun projects that I give away at Christmas. I can usually make 3 leaf items + a couple small things from a large bag of mortar (~80#). I use mortar, since the aggregate in most concrete mixtures is too large for a nice smooth finish. I usually end up doing about one batch per week, allowing them several days to cure – I use the sandbox that my kids outgrew. At least this way I don’t feel like I’m just throwing the leaves away in their prime. Hi Jan. Fantastic ideas and craft projects! You really can’t go wrong with an elephant ear!